I don’t actually hate football. As the mother of two sons, I have spent many, many hours watching it – either standing on the edge of school playing fields or from the comfort of the sofa at home. I have an appreciation of the finer points of the beautiful game (including the offside rule). And, as regular readers of this blog will know, I am a great admirer of that master of the free-kick, David Beckham. My gripe is that it is less than four weeks since the end of the World Cup and the wall-to-wall football frenzy that took over the whole nation. The sun is shining and we should be thinking about the summer sports of tennis and cricket, not football. I was just getting used to no longer being subjected to the endless hours of discussion and acres of newsprint dissecting England’s chances of bringing football home (all of which went into overdrive before Harry Kane had even kicked a ball). Now it is all coming back, and I am not sure I am ready just yet. Sky’s Soccer Saturday programme used to be a regular feature in the Hewitt household. The insights offered by Jeff Stelling and his team of merry men, punctuated by loud shouts of “goal!”, seemed to go on for hours and hours. There were no women taking part in the studio at that time, and the panel lineup is still all-male (although the show does feature some female reporters); hopefully that will change in the future. Add the joys of Match of the Day with Gary Lineker and friends, and you have some idea of the weekend viewing schedule in a house dominated by three male football fanatics. 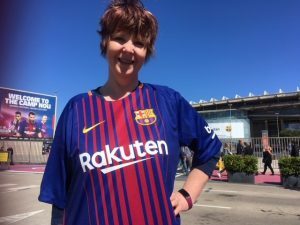 I have been to stadiums including Home Park (home to Plymouth Argyle),Hillsborough and Pride Park (my sons support Sheffield Wednesday and Derby County), and earlier this year I was dragged to Camp Nou during a trip to Barcelona. That was actually really interesting: football appears to be even more of a passion in Spain, and visiting the gift shop at the end of the tour was a real experience. I managed to overcome the scars left by this forced immersion in the world of football and actually enjoy some of the World Cup this time, although I still don’t know how the players cope with the stress of penalty shootouts – it was hard enough watching them. But it feels like there has been no respite whatsoever between the showpiece final and the new domestic season. Today, less than four weeks after France beat Croatia, Chelsea will take on Manchester City in the Community Shield, with the new season officially starting next Friday. I am sure that football fans are already salivating at the prospect of a weekend of action with Manchester City travelling to Arsenal (without Arsene Wenger), Newcastle taking on Spurs, Liverpool facing West Ham and Man United kicking off the season against Leicester. But I will not be joining them. The BBC offered a slight ray of hope this week, with a report that a council had advised clubs to delay the start of the new season because of the impact of the heatwave on pitch surfaces. Apparently some pre-season matches have been cancelled. Sadly, a closer inspection of the story revealed that the advice from Redditch Borough Council only applied to its local clubs. The hot weather will not affect the start of the Premier League season, as most of the clubs have artificial turf. So it appears as if there is no way of avoiding it. Even if I don’t actually watch any of the games or tune in to Soccer Saturday or Match of the Day, the news programmes and newspapers will be filled with analysis, transfer gossip, injury scares and the latest speculation on which manager is next for the sack. This season will be slightly different in my home city of Truro, where fans who normally watch their team from the stand at Treyew Road will be forced to travel to Torquay, but I am sure it will not stop Radio Cornwall getting excited about their matches.